Music of Miklós Rózsa, Roberto Sierra, Morton Gould, Maurice Ravel and more. Featuring world-renowned flute soloist Carol Wincenc. SOMA’s concertmistress, Susan Heerema, performs music of Vivaldi, Godard, Corelli, Rachmaninoff, Bruch, and Monti, with pianist David Maiullo, on the “Music for a Sunday Afternoon” series at the First Presbyterian Church of Ridgewood. Featuring opera’s dazzling divas! Beverages, wine and a nosh are included. See SRO Website for details. Mark your calendar for the MEA’s 49th Annual Piano Competition Winners’ Recital on Sunday, March 17, at 2:00 p.m. in the beautiful Leshowitz Hall at Montclair State University, 1 Normal Ave., Montclair. These outstandingly talented young musicians, ages seven through eighteen, will be performing an all Bach program of solos, duets, duos, and concertos. Everyone is welcome to attend this wonderful free concert. Juilliard musicians performing the music of Beethoven, Rachmaninoff, Arensky, and Schumann. More information at JCC Metrowest website. The Chamber Trio—violinist Soo Yeon Kim, cellist Eunbi Kim, and clarinetist Gunhwan Jung—presents a variety of music, including Beethoven's Clarinet Trio, Mendelssohn’s Piano Trio, Khachaturian’s Trio, and Dahl’s Trio as well as music by Haydn, Sarasate, Wieniawski, and Paul Jeanjean. More information at Weill Hall website. Our June concert, with guest soloist Halley Gilbert. Music of Ibert, Ravel, Debussy, Delibes, Offenbach, and Bizet. 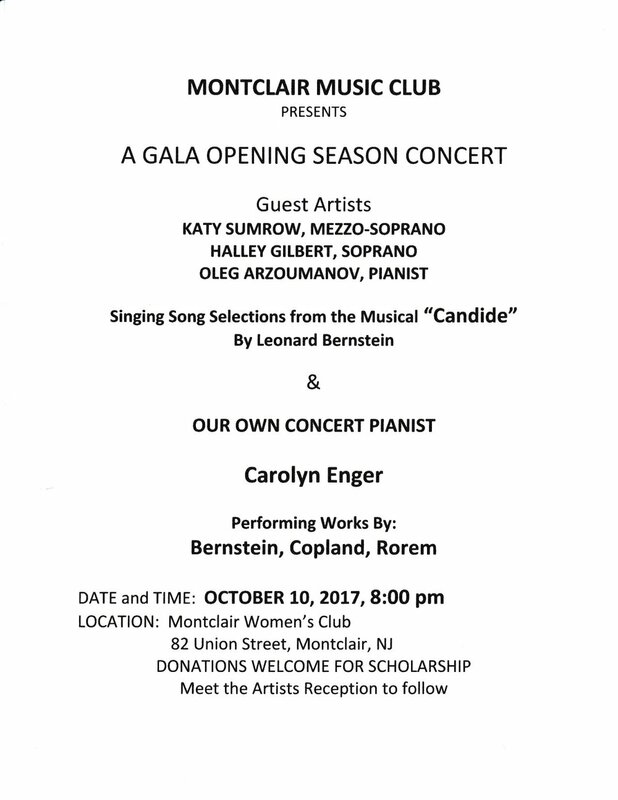 The Montclair Music Club presents a Young Artists Showcase at the Montclair Women's Club. Award-winning young musicians will present works of Chopin, Ravel, Mozart, Scriabin and others, for harp, piano, and voice. A $10 suggested donation will be used for the 2018-19 Scholarship Fund. A reception to meet the artists will immediately follow the performance. January Concert - How Suite it Is! Manuel de Falla, Suite 1 from "The Three-Cornered Hat"
A collaboration with the State Repertory Opera company and Columbia High School. A concert celebrating some of SOMA's highlights from past seasons.